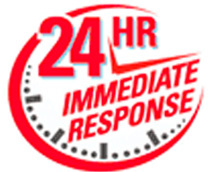 On the spot mobile 24 Hour Toronto Locksmith Services Available When You Need Us Most. We offer the widest range of locksmith services in Toronto including architectural hardware and High Security locks that include Medeco & Mul-T-Lock High Security Products. We operate from a well stocked centrally located retail shop & showroom located at 800 Petrolia Road Unit 1, Toronto, Ontario M3J 3K4. We offer residential services including everything from lock installation and rekeying, door and frame repair and burlar-proof safes and alarm systems. Our commercial locksmith services include a full of commercial panic hardware including automatic door operators. Keep our contact number on you in case of any emergencies -- you never know when you might need to call on us!